This research investigates the role endpapers play in the genre of children’s picture books. In the bookbinding profession, the endpaper affixes the pages to the thicker exterior of the covers. To the writers of many books, particularly picture books, the endpaper presents an opportunity to introduce or continue the story. The front endpaper draws the reader into the story. As the last page turns, the back endpaper recounts what the reader just read. This research paper discusses how the endpaper’s purpose in book design may shift by examining how various authors and authoresses, such as Michael Bond, Beatrix Potter, Ludwig Bemelmans, and Eric Carle, use the endpaper to captivate their audience. Before the establishment of picture books as a prominent section of children’s literature, no one seemed to care about the pages on the inside covers. The purpose of the pages, known as endpapers, is “to affix the pages of the book to the casing” (Harms and Lettow 17). According to Nikolajeva and Scott, authors of How Picturebooks Work, “almost nothing is written about the paratext of picture books such as titles, covers, or endpapers” (241). Despite the limited scholarly attention, endpapers are seen as more than a means to fasten pages to the spine of a book. Although the vast majority of books simply use a double spread of solid color, endpapers in children’s picture books serve a different role. They add color and a visual summary of the story. Increasingly, authors see the value of engaging the reader from the start with the endpapers and then urging them to “[talk] about visual aesthetic considerations and how these [contribute] to the story’s meaning” (Henderson and May 231). A common way to engage the reader in the story, as Nikolajeva and Scott note, “is to depict the main character several times on endpaper, performing various actions, most often not mentioned inside the book” (247). Michael Bond, the author, and R.W. Alley, the illustrator, use this tactic in several of the books in the latest Paddington Bear series. Forming three somewhat zigzagging lines, the same ten small drawings of Paddington Bear fall on the two front and two back endpapers in the same pattern. Each depiction of Paddington Bear denotes a different activity. One shows him contentedly eating what looks to be a cinnamon bun or some other sweet pastry, while in another he anxiously peeks up under his umbrella at the rain falling down. In all of the pictures, though, he wears his signature coat, and, in most, his hat and suitcase are nearby, signifying a unity between the stories. Underlining the sense of unity, the Paddington Bear series utilizes the same exact endpapers for several other Paddington Bear books. The only distinguishing factor becomes the background color. Since the ten pictures are outlines done in black ink, it is relatively easy to alter the color of the page to create a new effect for the separate adventures in the series. The book Paddington Bear has a rich cherry red hue, while Paddington Bear at the Circus has a bright lemony yellow. Children may then compare the similarities of the endpapers and know they are collecting a series. Many readers today do not know the Paddington Bear series originated from Michael Bond’s A Bear Called Paddington. First published in 1958 in Great Britain, not as a picture book, but as a book with eight chapters, it tells the same story of the Peruvian bear abandoned in Paddington Station. Perusing the first two chapters, “Please Look After this Bear” and “A Bear in Hot Water,” one may recognize the story in Paddington Bear published in 1998. Both the picture book and chapter book begin “Mr. and Mrs. Brown first met Paddington on a railway platform” (Bond, Paddington Bear 3 and Bond, A Bear Called Paddington 7). Even so, Paddington Bear clearly favors the audience of younger children. As a picture book, the emphasis lies on images telling the story, while A Bear Called Paddington utilizes the written word more. Numerous sentences from the original stories are cut from the newer story. Due to the more in-depth story, several features are explained further in A Bear Called Paddington. For instance, a reader familiar with the series published in the late twentieth century might recognize the Paddington Bear in A Bear Called Paddington from his hat and suitcase, but that bear does not have a coat. The one characteristic unifying the ten small drawings on the endpapers in the1998 picture books might confuse an audience because of the absence of the coat. The illustrator for A Bear Called Paddington, Peggy Fortnum, did not include the coat because the story of how Paddington obtains the coat is explained later in one of the chapters. Comparing the original, A Bear Called Paddington, and the newer Paddington Bear, the distinction between the endpapers might affect how a reader approaches each book. By viewing the multiple pictures of Paddington Bear in one of the 1998 picture books, a reader may want to find which story each picture belongs to and thus is more likely to collect the series. Even though similar stories occur in the chapter book and the picture books, the endpapers exemplify how the picture books are tailored to younger children. The pictures capture their attention and curiosity. What is the bear doing? The children then seek out the story accompanying the image. No such connection can be made with the blank pages of the 1958 book. HarperCollins Publishing clearly tailored the picture books to better fit the intended audience. In the 1958 book, the blank, White endpapers do not encourage a reader to seek out other stories about Paddington. Anticipation is limited to one book, not several. Oddly enough, the titles on the open books follow the standard practice of reading left to right, allowing the reader to discern the title of the book. Spanning the back and front cover, the title would then begin on the back page with the book closed. Aside from the titles of her other works, Ms. Potter, in her early sketches, also hid the original publication date in the endpapers. However, after asking the opinion of Norman Warne “the old date [of publication] (on nut bag) [was] scraped off the endpaper block” (Taylor 98). Ms. Potter clearly designed the endpapers to convey more information than simply showing her main characters. The well-known endpapers lined with Potter’s own watercolor illustrations of her characters served as the endpaper design for nearly one hundred years, from 1904 to 2002. The original 1902 publication of The Tale of Peter Rabbit actually “had grey-blue leaf-patterned endpapers” (Taylor 72). In 1903, “Beatrix was asked to provide a full-colour design to be used for her books’ endpapers” (Taylor 72). The request, however, came with a price. 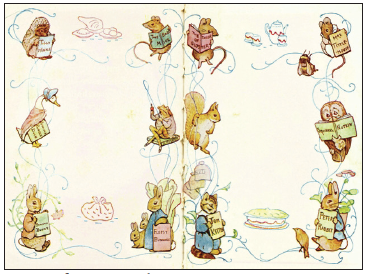 With the addition of the illustrated endpapers, four pages of other illustrations subsequently “were sacrificed in 1903” (Potter, 2002 edition of The Tale of Peter Rabbit 5). Potter, in a letter to Norman Warne, revealed that she “always [thought] that an end paper ought to be something to rest the eye between the cover and the contents of the book; like a plain mount for a framed drawing” (Taylor 72). Ironically, her preference for a simpler endpaper design was honored in 2002 when, to celebrate “the centenary of the first publication by Frederick Warne of The Tale of Peter Rabbit in 1902,” Frederick Warne & Co., as a trademark of Penguin Group Inc., reproduced The Tale of Peter Rabbit (Potter, 2002 edition of The Tale of PeterRabbit 5). Of the changes made, the biggest alteration was the removal of the illustrated endpapers. In their stead, faded outlines of the characters on a light blue background subtly form a base for an empty nameplate. Though the characters still grace the endpapers, the effect is not the same. The desire to seek out the other tales lessens when the reader must squint at the light lines to recognize the characters. Although Penguin Group produced the centenary collection of Beatrix Potter’s work as one bundle, and there was thus no need to lead the reader to the other stories, the original illustrations were still appreciated, for they reminded the reader of specific characters. Clearly seeing the animals dressed in human attire, the reader is reminded “her animals do behave like animals in man respects, but they are human in more respects. Through them, Potter comments on human behavior” (Moynihan and Shaner 138). Instead of utilizing the characters to frame a blank space as Beatrix Potter did on her Tales’ endpapers, Ludwig Bemelmans frames a picture of the setting in his Madeline series. By providing a context, Bemelmans permits the reader to enter the story before it has technically begun and “to introduce key elements of his story” (Eastman 70). The endpapers, as thresholds, permit the reader to slowly enter and slowly exit the story. 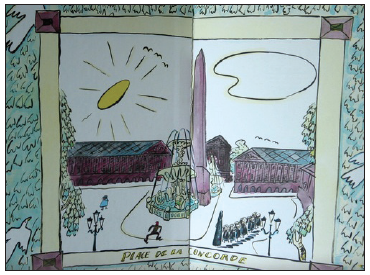 For example, the picture on the endpapers of Madeline allows the reader to slip into the setting of the historical urban center of Paris. As shown on the previous page, an expressionist drawing of a public square dominates the double spread endpapers “to suggest events to come” (Eastman 63). If the reader does not know the drawing represents the “Place de la Concorde” in Paris, the name is written on the bottom portion of the frame, thus “Bemelmans acquaints children with the landmarks of Paris” (Moyhihan and Shaner 208). After completing the story, the reader hopefully has a better sense of the architecture and urban planning of the city of Paris. The endpapers can also summarize the story. Vines surround the frame, just as they covered the old house. In addition, the doves that visited Madeline outside her window while she was in the hospital fly over the vines. The policeman who ran after the thief still patrols the city streets and there, in the bottom right hand corner, walk the “twelve little girls in two straight lines” (Bemelmans 4). The use of the same illustration on the front and back endpapers further reflects the importance of repetition throughout the story. Bemelmans purposefully writes in rhymed couplets, invoking a sense that the story “bounces and jiggles along” (Eastman 55). The jolly beat caused by the repetition assists young readers’ memory of the story. Bemelmans won the Caldecott medal for his illustrations in Madeline. Indicative of the Expressionist style, “his line drawings, with color overlaid, are quick and facile, capturing the fun and exuberance of the moment” (Moynihan and Shaner 208). The Expressionist movement originated in Germany but spread quickly to France, where Madeline takes place and where Bemelmans spent a great deal of time. Capturing the emotions of a single moment, Expressionism does not follow the traditional rules concerning shape and color. Instead, the distorted shapes and attention to a strong color palette provoke the viewer to consider a new perspective. Perhaps then, Bemelmans’ Expressionist endpapers ask the reader to keep an open mind as they read the story of Madeline, a French girl. “Already well received in adult art and literature,” Expressionism introduces a new way of viewing the world; further inviting the reader to reconsider what they see, the frame in the endpapers “is hung not on a wall but apparently out of doors, against a backdrop of leaves, thus making the reader question the reality of both the picture and the trees” (Eastman 59). Originally published by Simon & Schuster, Madeline debuted on a 23.25cm x 31 cm page (Eastman 53). When Viking Press purchased the rights to Madeline in 1958, the height of the books remained the same but “both side margins have accordingly been narrowed” to 22.75cm (Eastman 53). Other than the slight size change, “each book in the original series followed the formula of the first …. Each book opens with framed endpapers” (Eastman 62-63). Though Puffin Books and Viking Press are both trademarks of Penguin Group, Inc., the copy of Madeline in London, published by Puffin Books, slightly alters the presentation of the endpapers. Puffin Books does not place the endpaper illustrations at the ends of the book. Instead, one page separates the front cover from the endpaper. Is this an attempt to establish the endpaper illustration as truly part of the story, as something more than its role of hiding the transition between the cover and the pages? Either way, the drawing further distinguishes itself, because “rather than offering a multi-colored view of the story’s setting, the endpapers present an expressionistic, solid-red picture of London; the tail of a plane bearing the little girls breaks the frame, seemingly entering the picture” (Eastman 80). While the image embodies the Expressionist style of capturing a moment, such as a plane speeding towards a destination, the image also breaks with the other Madeline books, in which the frame is typically not broken. Repetition, as seen in Bemelmans’ Madeline, also dominates the picture book, Brown Bear, Brown Bear, What Do You See?, by Bill Martin Jr. Emphasizing the sequence of the animals mentioned in the book, the stripes of color on the endpapers serve as an instructional guide to children as they try to remember the list of animals and their colors. By matching the correct color with the correct animal, the children learn the names of the colors and how to handle “cumulative tales” (Lima and Lima 1054). Thus, when the children see the red stripe come after the brown stripe, as exhibited on the first page of this essay, they will know that after the brown bear comes the red bird and so on. Eric Carle, the illustrator for Brown Bear, Brown Bear, What Do You See?, also wrote his own story, A Very Hungry Caterpillar. Upon opening the cover, the reader immediately sees a splash of bright colors, as exhibited on the previous page Torn sheets of colored paper deformed by holes lay haphazardly across the double spread page resembling the numerous holes the caterpillar devours in the story. The colorful paper also resembles the “joyous explosion of color, a vibrant affirmation of the wonder and beauty of Nature” as the caterpillar turned butterfly expands its brilliant wings at the end (Carle dust cover). Carle’s “illustrations are a collage of multicolored tissue paper which he paints over to create texture and variety” (Kingman, Hogarth, and Quimby 204). The color then serves to snare the reader’s attention and allows them to see all the beautiful colors present in nature. Often overlooked, endpapers serve more than to seamlessly cover the transition from paper to binding. They are an important part of the picture book. Color, layout, shapes, and repetition all draw the reader into the story. Opening the book, anticipation of what is to come spurs the reader onward. Closing the book, the reader reflects on his or her experience and what he or she has learned. In this fashion, the endpapers serve an integral part in books, such as Paddington Bear, The Tale of Peter Rabbit, Madeline, and A Very Hungry Caterpillar, where readers can lose themselves in another world, just by opening the cover and looking at the endpaper. Bemelmans, Ludwig. Madeline. New York: Viking Press, 1939. Print. —. Madeline in London. New York: Puffin Books, 1977. Print. Bond, Michael. A Bear Called Paddington. Boston: Houghton Mifflin Company, 1960. Print. —. Paddington Bear. China: HarperCollins Publishers, 1998. Print. —. Paddington Bear at the Circus. China: HarperCollins Publishers, 1998. Print. Carle, Eric. A Very Hungry Caterpillar. New York: Philomel Books, 1987. Print. Eastman, Jaqueline. Ludwig Bemelmans. New York: Twayne Publishers, 1996. Print. Harms, Jeanne McLain and Lucille J. Lettow. “Book Design Elements.” Childhood Education. 75.1 (1998) : 17. Print. Henderson, Darwin L., and Jill P. May. Exploring Culturally Diverse Literature: Learning to Listen in New Ways. New York: PearsonEducation, Inc., 2005. Print. Kingman, Lee, Grace Allen Hogarth, and Harriet Quimby. Illustartors of Children’s Books. Boston: The Horn Books Inc., 1978. Print. Lima, Carolyn, and John Lima. A to Zoo: Subject Access to Children’s Picture Books. Westport: Libraries Unlimited, 2006. Print. Martin, Bill Jr. Brown Bear, Brown Bear, What Do You See? New York: Henry Holt and Company, 1967. Print. Moynihan, William T., and Mary E. Shaner, ed. Masterworks of Children’s Literature: Volume Eight: The Twentieth Century. New York: The Stonehill Publishing Company, 1986. Print. Nikolajeva, Maria, and Carole Scott. How Picturebooks Work. New York: Garland Publishing, 2001. Print. Potter, Beatrix. The Tale of Peter Rabbit. New York: Penguin Group, 2002. Print. —. The Tale of Peter Rabbit. New York: Penguin Group, 1995. Print. 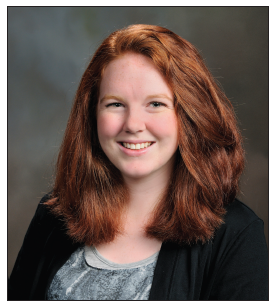 Katlyn Econom is a senior English major, concentrating in the literature, language and culture: pre-education track. After graduation in 2014, Katlyn intends to pursue a career as a secondary education English teacher. She would like to thank Professor Kathryn Graham for her guidance and support.